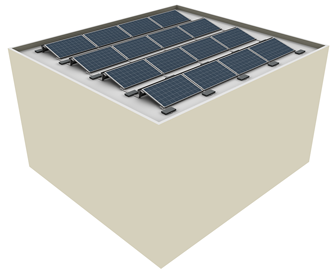 Commercial Flat Roof Solar Systems from Coretech Solar. Solutions for commercial flat roof solar systems. Commercial flat roof solar systems from SolarWorld. Coretech Solar provide commercial flat roof solar systems that can be mounted onto industrial and commercial roofs without penetrating them. This is advantageous for roofs with low load-bearing reserves. Coretech Solar can install solar panels on flat roofs which are tilted up towards the sun. This prevents the accumulation of dirt on the solar panel surfaces and ensures the capture of more light. This therefore produces a greater energy yield. Our systems maintain weather-resistance and provide a critical hold-down against wind. The new SolarWorld Sunfix aero 2.0 provides you with all of the advantages of an economic and aerodynamic flat roof system. It has a small number of main components, including wind deflectors. This guarantees fast and simple installation, attributable to its significantly reduced system design. The system components are light due to their aluminium construction. Durable and weather resistant, with a 10 year manufacturers warranty. They will not rust or become brittle, no matter what the weather conditions. The system is created with a 15 degree angle of inclination for maximum efficiency, and is suitable for use on flat roofs with an inclination of up to 5 degrees. SolarWorld commercial flat roof solar systems can be fitted to membrane, bitumen and pebble roofs. SolarWorld Sunfix aero 2.0’s minimum interruption and fast installation produces a commercial flat roof solar system that works to produce the best energy yield for your business. Cheaper installation costs from the clever system design creates a better return on investment for your business. Contact Coretech Solar today for expert advice on the selection and installation of commercial flat roof solar systems to suit your property and maximise your return on investment.